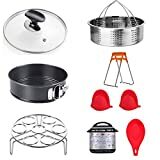 ★ COMPLETE SET FOR INSTANT POT 6QT - Our accessories kit comes with 1×Steamer Basket, 1×9-in Tempered Glass Lid, 1×7-in Springform Pan, 1×Egg Steamer Rack, 2×Silicone Oven Mitts, 1×Silicone Spoon Rest, 1×Magnetic Cheat Sheet, 1×Dish Clip. ★ PREMIUM QUALITY - The steamer basket and egg steamer rack are made of food-grade 304 stainless steel. Our silicone parts of the kit are made of food-graded silicone , FDA approved and BPA free. ★ TEMPERED GLASS LID WITH SPOON REST KNOB - The 9-in tempered glass lid with steam vent and stainless steel rim is perfect for slow cooking; transparent glass for clear viewing; the knob is designed as a spoon holder and an alternative self-standing knob provided. ★ MULTIPURPOSE ACCESSORIES - The stainless steel basket with two handles not only can be used as a food steamer basket, but also a food strainer or fruit container; the egg rack is perfect for hard boiled eggs, and also a useful trivet; the springform pan makes perfect shapes of cakes. ★ 100% MONEY BACK GUARANTEE - If you're not completely satisfied with your purchase of this mold, simply let us know and you'll be offered a FULL refund or replacement, no questions asked.